LIKE many boat skippers, I tend to take for granted that every lock I pass through on the Thames just works perfectly without giving too much thought to the incredible amount of work required to ensure that that is always the case. But then I saw this picture of one of the 11-tonne barge lock gates at Teddington Lock being lifted back into place after a major refurbishment and suddenly realised that this kind of work is constantly taking place all along the river. The gates – the oldest gates on the non-tidal Thames and also the heaviest on the river – were removed earlier this year and have been undergoing a two-month refit at the Environment Agency’s yard at Sunbury. The Agency says that the £60,000 refit should extend the life of the gates by up to 15 years – and when you consider they’ve already provided excellent service for more than 40 years, that’s a tribute to the skill and workmanship that went into their initial construction and to the quality of the timber used. EA engineer Andy Robinson said that the gates are made of African Ekki hardwood – also known as red ironwood – one of the most durable timbers in the world. 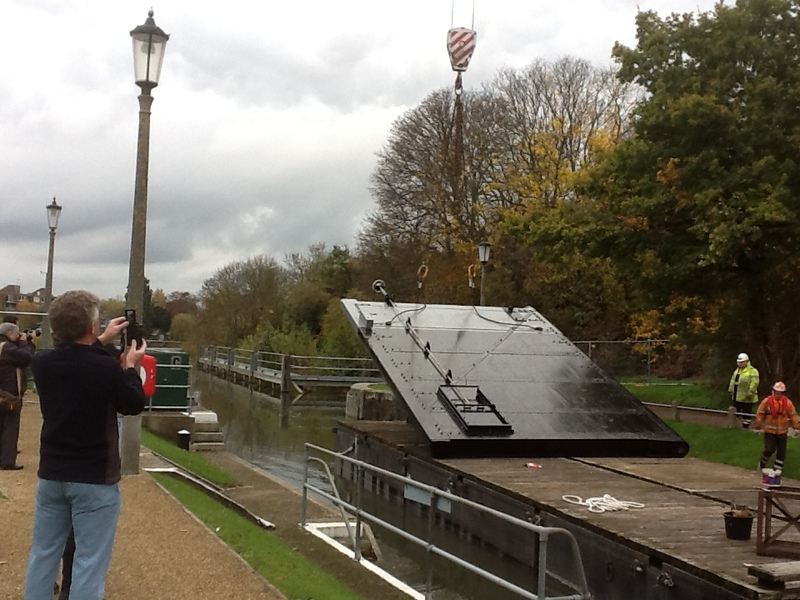 Because of the lock configuration at Teddington, the EA carried out the work without any disruption to river traffic. IT’S that time of year when dozens of boats up and down the river are being hauled or lifted out of the water for storage on land during the winter months – and you can start making a list of all the jobs that have to be done before the spring arrives and you can look forward to putting your charge back in the river for another season’s fun. Terra Nova, the Seamaster Admiral that my brother and I co-own, is in need of quite a bit of TLC. Her brightwork needs a thorough going over with peeling varnish much in evidence and I suspect the window seals may also have reached the point where they need replacing. But for an old girl (she was built in 1968) she’s still got a few good years left in her and part of the fun of owning an old boat is taking pride in keeping her up to the mark. MY heart goes out to the family of the gentleman who died after falling into the river as he looked at the work taking place on the construction of the new bridge across the Thames at Walton last week. It’s not yet clear how the accident happened but it underlines once more – if ever further proof were needed – that the river can be a dangerous place at times.